The feeders I tested can have rain hats fitted to them as you can see in the photograph to the right. I tested them with both chickens, ducks of various ages from 5 weeks to adults and varied the locations of the feeders from brooder box to covered and non covered field runs in a range of different weather conditions that included some very heavy downpours! 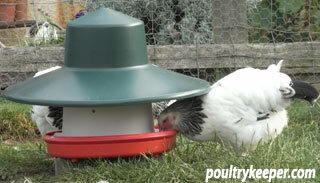 The Ascot feeders hold 2.5KG of feed and come in two flavours: with or without anti-spill fins. The anti-spill fins are designed to stop chickens from flicking out their feed from the feeder (as they are inclined to do as part of their foraging behaviour). An additional rain hat can also be fitted to the feeder if it is to be used outdoors and four feet that press-fit onto the bottom can also lift the feeder a couple of inches off the ground. I tested both variations of these feeders – the anti-spill version in with some of my 5 week old chicks until they were fully grown pullets and the standard version with my ducklings who didn’t require the anti-spill fins. 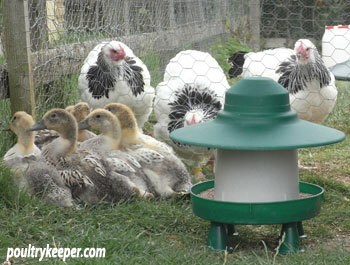 The feeder moved with the ducklings as they grew up, outside to the field where I then added the additional rain hat. I found both feeders easy to use. Refilling them was simply from the top where there is a good sized opening. Although I didn’t do this, they could also be hung by the sturdy metal bar you see in the photos if you weren’t using the rain hat of course. In my case, I preferred to use the clip on feet to lift them up off the floor a little. For the young birds, the feet kept the feeder above the wood shavings I was using for bedding so the food wasn’t filled with shavings and outside they provided enough height for the birds to fit under the rain hat to feed. £10.50 on the Amazon Marketplace for the finned variant with rain hat (I would recommend this one for chickens). £8.50 for the standard variant (better for ducks in my opinion). The second type of feeder I tested from BEC was much bigger and more suited to one of my runs with a dozen or so birds. The Handy Ultimate Feeder holds 12Kg of feed. There is a carry handle just inside the top and this screws firmly into the base. 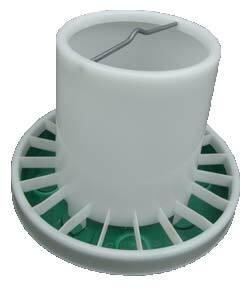 The white plastic outer tube is attached to the handle which is threaded to provide feed flow adjustment, so the amount of feed deposited can be adjusted by twisting the feeder. 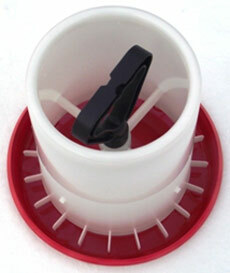 The Handy Ultimate feeder can have an optional rain hat fitted- but does this really work? Oh yes, without a doubt… as I write this, ironically the rain is coming down in sheets and hitting the window next to me. This is my most successful feeder yet and as a result of my tests, I have purchased 3 of these to use in my runs. I have no fear that the food will still be perfectly dry in all 3 feeders for my birds. I can highly recommend this feeder. £10.78 here on the Amazon Marketplace which seems very cheap for such a robust feeder of this size. £11.52 for the rain hat which is sold as an option but again, is reasonable considering the thickness of the plastic and the size of the hat. Both the Ascot and the Handy Ultimate feeder were very successful for me and I found the rain-hats particularly useful. There are some other manufacturer’s feeders with rain hats that I have tried in the past that have a hole at the top for a string to hang the feeder and I have always found these to let water run down onto the feed during heavy showers and wasting many Kilograms of feed is not something I want to consider with current feed prices. Both the Ascot feeder and Handy Ultimate feeder from BEC kept the contents of the feed dry during the heavy rain showers that we’ve had recently.